More of the latest snake news and research (for other recent updates, see posts from March, June, and August)—and, perhaps the most exciting news of all is that I have defended my dissertation and will be returning to writing more in-depth content in the next few months! a Western Diamond-backed Rattlesnake (Crotalus atrox). Wildlife Action Plan, although none are specific to snakes. Advocates for increasing state oversight of rattlesnake roundups in Texas received disappointing news this week when the Texas Parks and Wildlife Commission decided that they would not support a proposed ban on using gasoline fumes to collect rattlesnakes. Rather than reviewing and voting on the issue at their bi-annual meeting next month, the TPW Commission decided to remove it from their agenda entirely, citing "insufficient support from legislative oversight or the potentially regulated community". This decision marks the second time reviewing the ban has been put off, and unfortunately it is likely to be the last until the effort to reform roundups is re-initiated. The announcement included the statement that "TPWD [Texas Parts and Wildlife Department] staff still believe that there are better options for collecting snakes that do not adversely impact non-target species, and we will continue to work with the snake collecting community to develop and implement best practices that reduce potential impacts to these species", although in the absence of specific details it is hard to believe that this issue will remain at the fore of wildlife management in Texas without continued pressure from advocates of scientific rattlesnake management. However, Representative Susan King of Sweetwater's 2015 house bill 763 requires that petitions to state agencies (including TPWD) that are signed by <51% Texas residents are not valid, which means that the ability of non-Texans to influence policy on this issue is now greatly diminished. If you're not familiar with the issues surrounding the gassing ban, I encourage you to read the 2016 Snake Harvest Working Group report, the same document that was available to the TPW Commission prior to their decision this week. Among other topics, it contains data on the adverse impacts of gassing on non-target endangered species, which is the primary impetus for the ban. It hints at human health impacts of consuming meat from gassed rattlesnakes. The SHWG report also summarizes previously unavailable data on roundup economics, showing that profits are not related to the number of rattlesnakes at an event and did not decline after gassing was banned in Alabama and Oklahoma. Stakeholder survey responses and the vast majority (>90%) of public comments from Texans were in favor of the gassing ban, as are many TWPD employees. The TPW Commission is solely responsible for this decision. You can let the TPW Commission and Texas State Representative Susan King of Sweetwater (or your own state representative, if you live in Texas) know whether you think they are acting in the best interest of the majority of the public and in accordance with game management principles at the links provided (if you no longer have a fax machine, you can send a fax over the Internet here). This discovery is from 2014, but it's newer than either of the past posts to which it's germane and I just found out about it. Perhaps you've seen the incredible rapid hatching behavior that treefrog eggs have evolved to escape from snake predators, including cat-eyed snakes (genus Leptodeira), blunt-headed tree snakes (genus Imantodes), and snail-sucking snakes (genera Sibon and Dipsas). These snakes also eat a variety of other gooey prey, such as earthworms, leeches, snails, slugs, adult frogs, caecilians, and, more rarely, non-gooey prey like lizards and reptile eggs. They have a number of adaptations that help them consume their sticky, viscous prey, including long, slender teeth, skull bones and muscles modified for extreme lower jaw extrusion, and a short-snouted, large-eyed look that resembles a snake embryo. Recently, a team of scientists from Brazil discovered a new one: a protein-secretion delivery system in the lower jaw. Are the secretions venom? No. Dipsas and its relatives always extract snails using a sudden strike, followed by fast, alternating probing motions of the mandible inside the shell; this behavior could hardly depend on a chemical reaction of any kind. Instead, the gland secretions probably play a role in mucus control and prey transport rather than immobilization or killing of the prey. Although the glands in some species are associated with muscles, they are not connected to any teeth, but rather open onto the floor of the mouth, which in some species is covered with extensively loose, folded skin. 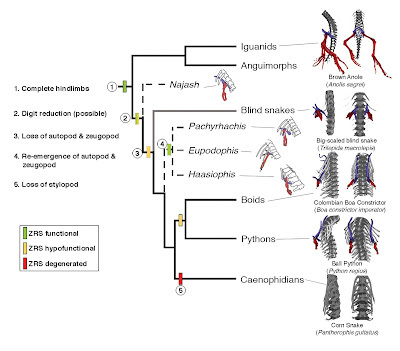 Hypertrophied infralabial glands have been known from some dipsadine species since the 1960s, but the new paper describes the muscles and other soft tissues surrounding them and documents their variation among several dozen species of this very speciose group of snakes. 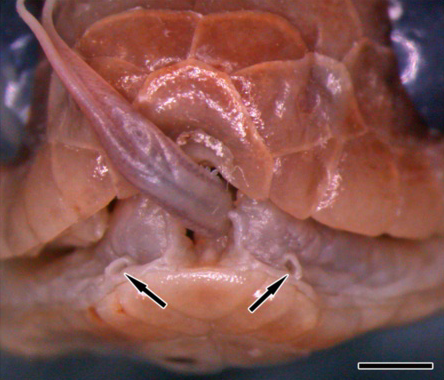 On the other side of the world, pareatid snail-eating snakes have independently evolved a similar lifestyle, complete with upper jaw glands of perhaps similar function. Why snakes are long and Why do snakes have two penises? 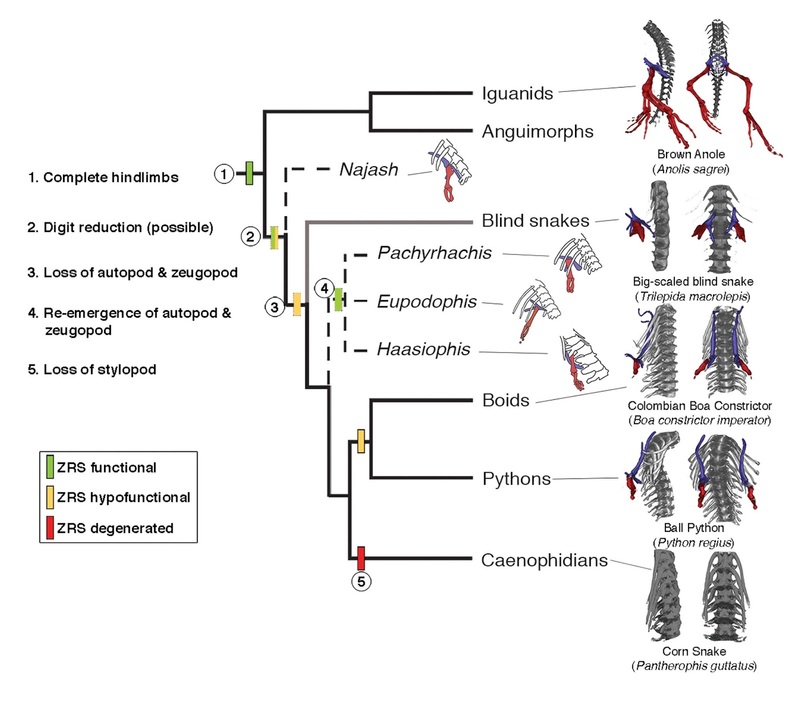 living snakes, and extinct snakes with fully-developed limbs. that has been partially deleted in snakes. 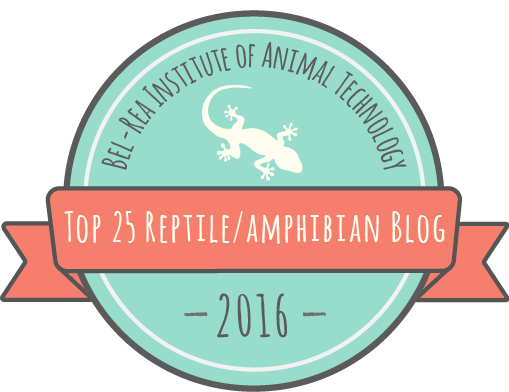 Many people are familiar with the tiny vestigial legs or "spurs" of boas, pythons, and other henophidian snakes. These structures are sexually dimorphic and are used by male boas and pythons in male-male combat and also to titillate females before and during mating. New data from the University of Florida describes how the spurs are formed: a weak flicker of activity by a gene called Sonic hedgehog (SHH) during the first few hours of embryonic development, in contrast to strong, sustained activity of this gene in lizard embryos throughout their development, forming legs. In snakes, unique genetic deletions from an enhancer of SHH explain its weak activity; transgenic mouse embryos with the same deletions showed similarly weak SHH activity, whereas mouse embryos grown with a lizard enhancer developed normally. Caenophidian snakes, such as vipers, gartersnakes, and cobras, had more extreme deletions and mutations, with the cobra barely retaining any of the SHH enhancer gene. Amazingly, the researchers also found that HOXD13, the part of the limb-building gene that's responsible for building hands and feet, was unaltered in python embryos, and that python embryos develop not just a pelvic girdle and femur, which form the spur in adulthood, but cartilaginous templates of a tibia, fibula, and foot, which are reabsorbed prior to hatching. Although living snakes appear to follow a gradual pattern of limb shrinkage and loss, some extinct snakes that are thought to have been more similar to boas and pythons than they were to blindsnakes also had fully-developed, albeit small, limbs, complete with feet, as adults. This new discovery helps explain the apparent evolutionary "re-appearance" of these structures; they were never completely lost in the first place. As for the reason why not, snake HOXD genes and their regulators appear to be equally important to the development of their paired hemipenes, structures of obvious importance.